Emmerdale actors Dominic Brunt and Mark Charnock bring the walking dead back to Headingley as the Leeds Zombie Film Festival, now in its fifth year, returns to the Cottage Road Cinema on Sunday 22nd April. This year’s lineup is an eclectic mix of six of the best modern and classic Horror films. The films will be shown over 12 hours ending at midnight and have been selected by festival organisers and self-confessed Zombie obsessives Dominic and Mark, who play best mates Paddy and Marlon in the popular ITV soap. The duo will give a short introduction to each film. For some fans of Zombie culture, it will be the first time they have seen the classics and latest movies on the big screen. Fans have the chance to see some teasers from Dominic’s new zombie film Before Dawn, which he directed and stars in. Set in the idyllic Yorkshire Moors, Before Dawn finds a married couple smack bang in the middle of a zombie uprising. Before Dawn is being screened at film festivals around the world before its British release. Film fans are invited to get into the Zombie spirit and turn up in their undead finery, artificial blood and limbs. While the event is all about celebrating all that is great about the zombie genre, the festival does has a serious side as all profits made will be donated to the World Society for the Protection of Animals (WSPA). Tickets are £15 and the event is strictly over 18s only. Tickets can be reserved in advance by calling the hotline on 0113 275 1606 or brought from the box office on the day subject to availability. The festival starts at 12noon, with doors opening at 11am, and finishes at midnight. Ticket holders are then invited to the after-show party from 12am till 2am at The New Inn pub opposite the cinema. 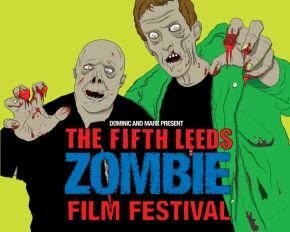 Emmerdale actors Dominic Brunt and Mark Charnock have revealed the lineup for this year’s Leeds Zombie Film Festival, when it returns to the Cottage Road Cinema, on Sunday 22nd April. Zombie fans will enjoy six gruesome and gory zombie flicks during the 12-hour blood-fest. Festival organisers and self confessed Zombie obsessives Dominic and Mark, who play best mates Paddy and Marlon in the popular ITV soap, have chosen Dead Set, the critically acclaimed BAFTA-nominated horror drama created by writer Charlie Brooker. Shown in its entirety, Dead Set features some of Big Brother’s well-known contestants as well as former host Davina McCall. It chronicles a zombie outbreak that strands the housemates and production staff inside the Big Brother House, which quickly becomes a shelter from the undead. Next up is the US comedy Zombieland starring Woody Harrelson, Jesse Eisenberg, Emma Stone, and Abigail Breslin as survivors of a zombie apocalypse. Together they take an extended road trip across the South West in an attempt to find a sanctuary free from zombies. Bringing some European zombie madness is the 1980 Italian production Nightmare City. Directed by Umberto Lenzi, a military plane makes an emergency landing and opens its doors to reveal dozens of zombies who promptly go on the rampage. It’s left to one television reporter to save the day…as you do! Also on the line up is low budget zombie flick Pontypool. Based on Tony Burgess’ award winning novel Pontypool Changes Everything, the film takes the familiar concept of a virus changing the inhabitants of a small town into homicidal lunatics, and adds in a mind bending twist by having the infection in question spread through a corruption in the English language. From the Far East, Versus is a Japanese supernatural martial arts zombie film – so many genres, so little time! A group of mobsters, who use one of the 666 portals in a forest as a connection between this world and the next, are forced to contend with all of the men they have killed and buried in the forest as they become reanimated as zombies. This is an ages-old conflict that has been recurring in a cycle involving all of their reincarnations. The last film on the bill is yet to be announced as Dominic and Mark are keeping it a secret for now but all will be revealed on the day, when they introduce each film and explain why it was chosen. For some fans of Zombie culture, it will be the first time they have seen the classics from the past on the big screen. It’s also a chance for them to watch some more recent contributions to the genre that may have passed many fans by. While the event is all about celebrating all that is great about the zombie genre, the festival does has a serious side as all profits made are donated to the World Society for the Protection of Animals (WSPA). Tickets cost £15 and the event is strictly over 18s only. Tickets can be reserved in advance by calling the hotline on 0113 275 1606 or brought from the box office on the day subject to availability.